Image & Form is an established, experience game development studio and publisher, yet it was SteamWorld Dig on the 3DS that gave the company a notable break and turnaround in fortunes. After causing a stir on 3DS it was eventually ported to Wii U and most platforms, so the announcement of follow-up - not a direct sequel - SteamWorld Heist was always interesting; announced for multiple platforms including 3DS and Wii U, which would come first? 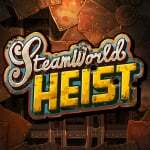 The exciting news is that the 3DS will be the first system to receive SteamWorld Heist this Fall. Announced live on the Nintendo Treehouse show from E3, this is confirmation that Image & Form is fully appreciative of the breakthrough it received with the help of an enthusiastic 3DS eShop userbase. Image & Form informed of this news before the madness of E3, so we caught up with CEO Brjann Sigurgeirsson to talk over the release schedule, why 3DS is first and how Heist development is progressing. It's been announced that SteamWorld Heist will come to the 3DS first. Can you give us a brief history of how you came to this decision? We thought about it long and hard... no, it was actually quite easy! At one point we discussed going to PC/Mac/Linux first, but please see the next question for the main reasons behind the decision to go with the 3DS first. SteamWorld Heist will come to 3DS first, and then to all other current-gen platforms. The order among them is yet to be determined. It could be important to mention that we haven't made any deals - we've decided to let the release schedule rest on our own choices. What are the biggest factors for you when making a choice like this, and what would you say is the most notable reason for choosing 3DS as the launch platform? First, it's a matter of conscience. It dates back to August 2013, when we first released SteamWorld Dig on Nintendo 3DS and raced to the #1 eShop spots in America, Europe and Australia. In a fit of emotion I couldn't keep my trap shut and in some forum ecstatically announced that our next game would MOST DEFINITELY come to the 3DS first. Dig was our first self-published game that received major attention, and as a result I was speaking to media the whole time. Some of the other guys in the office, cautious of my transformation from mediocre programmer and wallet to self-proclaimed media rock star, suggested early that I shouldn't be over-promising, that those sneaky journalists would try to make me divulge things the team would have to deal with later. I promised them I wouldn't promise too much, and then promptly promised that our next release would hit the 3DS first. At the time I shrugged it off and thought that the intense love we were getting from the 3DS community might wane, and that nobody would remember my "3DS first!" outburst long after the fact. I'm proud to say it's a matter of loyalty. We have been surprised to see how steady the sales of the 3DS version of SteamWorld Dig have been. In the end, we're happy to give something to a community that's very supportive. But then I saw a discussion on NeoGAF around six months ago where people were discussing SteamWorld Heist, and someone mentioned that "the devs have promised that it'll come to the 3DS first." The Internet has a long memory! Second, it's a matter of convenience and production schedule. We're familiar with 3DS development, and we decided early that we would anyway have to develop specifically with the 3DS in mind, since it's so different from the other platforms. 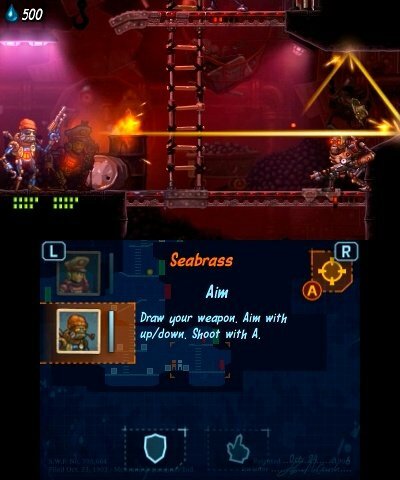 In other words, it's no mere port - SteamWorld Heist is built for the 3DS from the ground up. That obviously doesn't mean it'll be less of an experience on other platforms later, but it really makes good use of the two screens, and we've got performance issues sorted out right off the bat. And third, I'm proud to say it's a matter of loyalty. We have been surprised to see how steady the sales of the 3DS version of SteamWorld Dig have been. In the end, we're happy to give something to a community that's very supportive, and perhaps doesn't see too many third-party "first releases". E3 is the first time you're showing a playable build of the game on 3DS, having previous opted for the PC version at shows. Has it been particularly challenging - on a technical level - bringing this game to the 3DS? In a sense it IS challenging, because you always need to keep track of the frame rate on the 3DS. But although SteamWorld Dig was our first try at the platform, I'd say we're pretty good at developing for the 3DS. We make pretty good use of it. Is it the fully featured game on the portable, or have any sacrifices been made in comparison to the Wii U eShop and other HD versions? It's fully featured. It would be unfair to bring a game early to one platform and then flesh it out considerably in subsequent ports, saying "hey, be happy, at least you got it first." It's a lose-lose proposition, I think, almost like punishing early adopters. A sure-fire way of disappointing everyone a tiny bit. 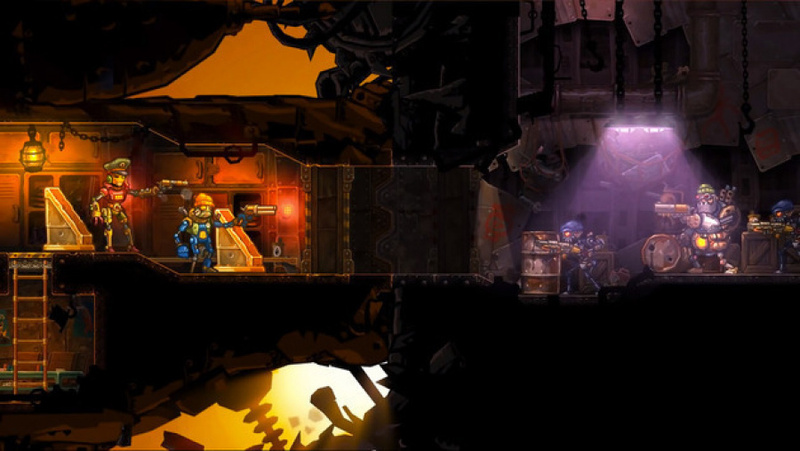 Is the adjustment to the smaller screens a simple 1:1 in ratio, or have you - like in SteamWorld Dig - made adjustments to viewing angles and the camera between the portable and HD versions? I think you'll be able to see a bit farther in HD versions, which actually addresses a shortcoming on all other systems - the lack of a persistent secondary screen. The 3DS has a great advantage there, that we can use the lower screen for an in-combat ship map. I think that's good to remember if someone slams the platform for its lesser performance, small screen estate, and so on. The very existence of two screens is fabulous, and contributes to the immersive feeling when you play on the 3DS. You don't need to muck about calling up screens to get the information you need - it's right there. Moving onto the game in more general terms, is the final structure and open-ended nature of the campaign now nearing completion? How far have you progressed in completing the game's world (or universe)? That's a very interesting way of posing the question. How far "towards the end" of SteamWorld this game is remains to be seen. We have quite a few ideas for games that come "after" SteamWorld Heist, chronologically. When George Lucas announced parts 1-3 of Star Wars, it sounded pretty strange - but apparently this was something that he'd had in mind from the start, being quite frank about the original movie trilogy being parts 4-6. I specifically remember seeing "Episode V" and wondering about it when I first saw The Empire Strikes Back. Where were episodes 1-3? The next game we'll make in the SteamWorld series is probably going to take place before SteamWorld Heist. 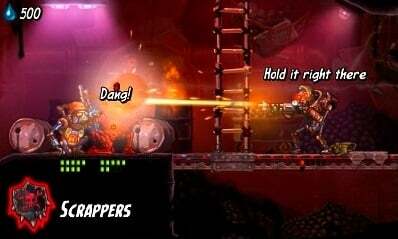 Since we feel that we can use SteamWorld as an umbrella universe that can contain any kind of game genre, we feel that progressing the story in order is not that important. I'm not saying that we're anything like George Lucas! But on a grand scale Star Wars legitimised producing prequels and sequels out of order. The next game we'll make in the SteamWorld series is probably going to take place before SteamWorld Heist. Since we feel that we can use SteamWorld as an umbrella universe that can contain any kind of game genre, we feel that progressing the story in order is not that important. In the end, you'll have the whole picture. Calling up another movie reference here, Memento does it all backwards, and is no less interesting for it. With the music partnership with Steam Powered Giraffe, robot designs and fan submissions for hats etc, is it fair to say that you're putting a great deal of effort into the 'character' of this game? How important is this factor in development? It's VERY important - and in a sense a product of lessons learned from SteamWorld Dig. We had almost no collaborations at all in that game, apart from the eminent H.M. Hammarin who made the music and sfx for Dig. The characters in Dig were likable, but they were quite "cardboardy", if you understand how I mean. It's no coincidence that Rusty is the quiet, strong type - very much like Clint Eastwood's Bill Munny from Unforgiven. We realized that we wouldn't have time and resources to flesh out the characters very much that time. With SteamWorld Heist we're in a new position. We've been able to spend much more time on the development, and not only in terms of gameplay and graphics: this time around we've worked more on the music, the story, the characters. That means that we've been able to work more with references to other things, and to give adequate back stories - proper places - to the characters that appear. Are you confident that the 3DS will, once again, deliver a significant proportion of this game's sales and audience? I've played SteamWorld Heist extensively, so - yes, I believe so! It's remarkable how well it works on the 3DS, and it's very hard to play the game and put it down after just a few minutes. Even if I decide to do a short playthrough where I want to look at a specific detail, I don't go "unpunished" - five minutes quickly turns into an hour. There's something about being so close to the screen - it's so immersive, and every successful shot is SO gratifying. It's almost like tactile feedback. Do you have a final message for our readers and 3DS owners? You may not know this, but Nintendo Life is a distinguished place for us. Before releasing SteamWorld Dig, getting a write-up - any kind of write-up - on Nintendo Life was one of our written goals. That's how small we considered ourselves, and how hugely we thought of the site. If you look through the history of articles Nintendo Life has published about us and our games up until now and look at the comments, you'll find that almost all comments are very positive. Thank you for that, readers - it's probably hard for you to imagine how often game developers like ourselves "wear our nerves outside our shirts", as we say in Sweden. Encouragement like yours is very much like oxygen - it gives us the strength to go the extra mile. So, readers and 3DS owners: Prepare for boarding this fall, and prepare to be entertained. We'd like to thank Brjann Sigurgeirsson for his time. Well SteamWorld Dig did not dissapoint. It was a gem of game and I treasured every session I had playing it. In that case, I'm proud to say I'll buy it as soon as it comes out. SteamWorld Dig was lots of fun, can't wait to play the follow-up. Looks cool. If I get it, I'll get it on my Vita. One thing that I don't get, why are people trashing on this game? Youtube like to dislike it pretty bad. It looks really good to me. I got steamworld on the WIi U with the Humble Bundle, and i am absolutely loving it. Very excited to see more of this series. Great interview. Good luck to them. Brjann Sigurgeirsson seems like an absolute delight anytime he says anything. Loved steam world dig to bits, have very high hopes for heist. "The exciting news is that the 3DS will be the first system to receive SteamWorld Heist this Fall." I'd be more excited if Wii U was getting it first. It will definitely be a game I'll buy on my 3DS and Wii U, but still, I want the latter more. But will they offer any sorta cross-buy between 3DS and WiiU? I loved Dig on my 3DS, but never bothered to get it on WiiU having already beaten it. I have yet to download the 3DS version and a few wii u games from my nindie bundle though. awesome, count on me for 3ds buy! I'd rather play this on the Wii U, but then again I really want to support these guys with a day one buy. 3DS it is! Refreshing to see developers out there that are loyal to Nintendo, and anxious to put more out on the platforms. I happened to think Dig, while not a perfect game, was quite ambitious and fun to play. Looking forward to the follow up. @Uberchu By the time this game comes out, Metal Gear Solid V will be out, and other AAA games will be releasing. I won't have trouble waiting. Nintendo's knows how to make games, but I like the Vita as a device more. If games will be on both systems, I'll always pick Vita. I'll keep my 3DS around though. Fire Emblem Fates will consume me. Cheers to that! And their loyalty will be repaid in kind. Loved Steamworld Dig so I can guarantee I will be picking up Heist when it comes out knowing that I will be getting another quality game. It's gonna be a day one purchase for me , LOOKS AWESOME., the Steam World games are a blast and the art styles are AMAZING ., simply cannot wait and knowing this is releasing on the 3DS first just icing on cake , just the icing on the freaking cake I tell ya .. I'd rather play it on Wii U, but if I can get it first on 3DS, I'll gladly do so. Besides, I have both a 3DS and Wii U copy of SteamWorld Dig, so maybe I'll double dip again here. Two words: DAY. ONE. And I don't say that very often. I own this on every console I own that they made this game on. I will get Day One on both 3ds and WiiU. Will eventually get on PS3 and Vita as well. just a great game to pick up and lose yourself in. Well, the first one at least. Hope this one is as good if not better than the first. Ha, I laughed at the bit where he said it was because he couldn't keep his mouth shut and proclaimed that the next game would come to 3DS first. I like that honesty. "Image & Form Discusses SteamWorld Heist And Why It'll Be on 3DS First"
Because nobody has a Wii u, as simple as that. I remember when SteamWorld Dig had just recently come out and was first gaining popularity, I wrote a comment on a NintendoLife article about the game asking about the gameplay to see if it was up my alley. Brjann Sigurgeirsson himself responded and described the game in a way only a doting creator could. His response convinced me to get it, and SteamWorld Dig proved to be one of my favorite gaming experiences of recent memory. A lot can be said of a studio as dedicated to its games as Image and Form is. Even more can be said of a developer as dedicated to his fans as Brjann Sigurgeirsson is. It's clear that this incredible dedication is what makes this studio's games as great as they are. I am looking forward to Steam World Heist with great anticipation, and I don't expect to be disappointed! I enjoyed playing Steamworld Dig a lot, so I'll be keeping my eye on reviews of this title when it comes out, and if I get it, this time it'll be on the 3DS. Easily my most-anticipated 3DS title of the year. I cannot WAIT. I hate turn based combat, but man...SteamWorld Dig was so good, and I really enjoyed the Treehouse presentation for Heist. These Image & Form guys seem really solid. I'm getting it for sure. 3DS sounds like the definitive version. You get both 3D and the important second screen. So much better than Vita or something else. Did the NL editors ever take up the invite from Image & Form to visit the Celebrity Rave Review Champagne Hot Tub? Well ambassadors will get all of our early. Looking forward to this game. 3DS is still my preferred console despite the TV screens and superior power of PS4, Wii U! Might get this for both the Wii U and the 3DS. Looks amazing. I'll get this for 3ds when it's released For, Steamworld Dig, I only got it on Wii U.
I loved Dig, I really can't wait for this. However, you really have to feel bad for Ninty when this is some people's most anticipated game for their systems. Hi everyone! Julius from Image & Form here. We just wanted to thank all of you for your fantastic support and kind words! It's what keeps us going at all times. You are awesome! @moomoo I'd expect a 2015 vita release not 2014... if anything at all. apparently it will be more than just a simple port any way.